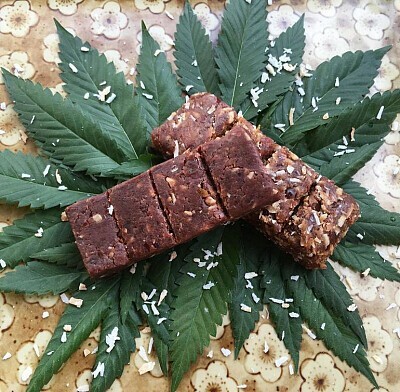 All natural, earth ingredients meet to create the ultimate healing superfood bar! These delicious chewy bars will keep you fueled and full for hours. Tastes much better than most protein bars but still packs 20g protein. So tasty you'll forget it's medicated! (but don't) A great price for 100 mg of THC! Raw, Organic, GMO-free, 100% plant-based, Gluten Free... Chocolate Chip flavor is made with dark chocolate, maple syrup, sunflower seeds and whole bud infused Coconut Oil. Vanilla Coconut Flavor is made with fiber rich coconut, and gooey sweet dates, and dreamy mixture of sweet vanilla and maple extract.